Even when you read regularly, it takes time to find something truly great; but every once in a while, there will be a book, a poem, a story, that truly turns you on your heel, holds you in place, and keeps you loving, recommending and discussing that piece for months. 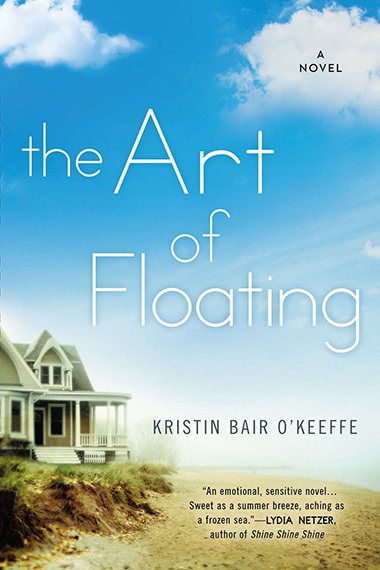 Though first described to me as “a great summer read” and “something good to take to the beach,” Kristin Bair O’Keeffe’s The Art of Floating was precisely that piece I needed to improve my summer—and not just by giving me a book to read under an umbrella next to the waves. Sia Dane’s personal story, at first glance, may appear to be a simple one: a woman well-defined and independent in her writing life and her marriage to her husband, Jack, and then grief-stricken and unable to write upon his disappearance one year before the opening of the novel. This, in and of itself, may suggest a straight-forward story of grief, whether or not beautifully-written. Even with the addition of a strange man on the beach, who Sia discovers early in the morning, would support this story-arch, perhaps with the inclusion of a romantic turn (which would fulfill that “take it to the beach” mantra). However, even if this is how Sia Dane’s story begins, it is hardly conclusive or summative, and we end in a very different place than we might have guessed. What is so beautiful, haunting, and even bewildering, about this novel is the way in which Bair O’Keeffe can first introduce us to a story we think we know, and twist it into something symbolic, surreal and highly-bodily, which immediately removes The Art of Floating from the common “beach read” section and propels it to the realm of literary fiction—and presents it as a gorgeous example of literary fiction, at that. When I was first introduced to this title, I did the unthinkable thing—something that I am very guilty of doing on a regular basis, despite my extreme dislike for spoilers: I read the back cover. And I knew, deep in my gut (perhaps in the same place where Sia finds her flopping fish), that this book was different. In the first line of the synopsis, it summarizes, “When her beloved husband, Jackson, disappeared without a trace, popular novelist Sia Dane stopped writing, closed down her house, stuffed her heart into a cage, and started floating.” I read that line over and over, gushing with excitement, at the sheer potential of the novel being refreshing and different. When the book arrived at my home, I wanted so badly to break the reading order of books I had “scheduled” before this one, but I held my ground, clenched my teeth, and waited until it was Bair O’Keeffe’s turn—and, boy, was it worth the wait. It was more than I could have bargained for, expected, or dreamed of. The events detailed on the back cover do indeed happen, for real, within the context of this novel. This reality is created and made acceptable—made beautiful and strange and heart-felt—within the first several pages of the book, when Sia discovers the man on the beach (who she names “Toad”) and feels a literal wave of his sadness enter her body—as well as a large, flopping fish in her stomach, which she feels move whenever she feels empathy for another person. Obviously, this is outside the operational realm of our bodies and the abilities of them; but that, in the end, is what makes these surreal moves so beautiful and true, when we are given that image that is, at once, strange and capable of retelling those emotions that we otherwise feel are beyond the reach of description. In their surreal nature, they apply truth. Kristin Bair O’Keeffe’s novel, The Art of Floating, is too entirely beautiful to reduce to “a great summer read” or “something good to take to the beach.” Though I did read this over the summer, and while the book did make an appearance at a water park, it was not read in that time or place out of simplicity or lack of expectation. Rather, reading that back cover pushed my expectations to a higher level, where I wanted strangeness and originality and literary-ness to thrive. And it did. This is one of the most gorgeous and emotionally-demanding novels that I have read in years, and it tackles the duality of the lost and found with renewed fervor and poignancy I haven’t seen in fiction—“women’s” or not—for quite some time. Not only does this novel require that you open yourself to a wide range of emotions, but it demands you to open your mind to the unusual physicality of these emotions, their shift in physics, even; and it even projects into you those emotions you’re seeing and feeling on the page—the frustration and need for patience with the Dogcatcher and the therapist, the split between being happy and appalled by Jilly, the love and pain felt for Jackson and Toad . . . and the possibilities, the range of emotions and reactions, continue. When it really comes down to it, this is such a deep and well-thought-out examination of how we grieve and love and relate to one another. Perhaps it’s unrealistic to expect this much from one novel, to want a book to meet so many demands, effectively, between a pair of covers—but I feel it’s all been done here; and I know when I read it again, I’ll feel the same way . . . and the surprises will keep coming. KRISTIN BAIR O’KEEFFE is the author of the novels The Art of Floating (Penguin/Berkley, April 2014) and Thirsty (Swallow Press, 2009). Her work has been published in numerous magazines and journals, including Poets & Writers Magazine, The Gettysburg Review, The Baltimore Review, The Christian Science Monitor,HYPERtext, and Bluestem. She has an MFA in Creative Writing from Columbia College Chicago and has been teaching writing for the past twenty years. In late 2010, after nearly five years in Shanghai, China, she repatriated to the United States and now lives north of Boston with her husband and daughter.